Little and Muir head distinguished the difference between nuclear bomb survivor sand patients treated by radiotherapy by the level of cell killing at doses higher than 2 Gy. Other reports suggested a threshold of about 0.6 Gy in adults after fractionated radiotherapy and of 0.1 Gy in children after acute irradiation. Schneider has applied a linear-quadratic model to estimate second cancer induction following radiation therapy. The aim of this study was to calculate doses to OARs (brain and esophagus) and to estimate the secondary cancer risks after H and N VMAT compared to IMRT and 3DCRT. To avoid confounding issues linked to patient's anatomical characteristics and assess organ dose deposition precisely, we used a standardized the Imaging and Radiation Oncology Core (IROC -Houston) H and N anthropomorphic phantom based on realistic patient anatomy. All plans (3DCRT, IMRT, and VMAT) were generated in a Pinnacle treatment planning system (TPS, Philips, version 9.4 Fitchburg, WI, USA). VMAT treatment planning was done using clockwise and counter-clockwise dual arcs with angles 182°–178° and 180°–184°. Nine-field IMRT (beam angles: 200°, 240°, 280°, 320°, 0°, 40°, 80°, 120°, and 160°) the commonly used angles at MD Anderson Cancer Center, were used for IMRT, and four fields were used for 3DCRT (anterior-posterior, posterior-anterior, left lateral, and right lateral). The treatment plans were created with the guidance of an expert and followed MD Anderson standard guidelines. The IROC H and N phantom were used in the dosimetric comparison among different H and N radiotherapy techniques (3DCRT, IMRT, and VMAT). Computed tomography (CT) images (1.5 mm slice thickness and slice interval) were taken from the Philips Brilliance 64-slice scanner (Philips Healthcare, Andover, MA, USA) containing 512 × 512 pixels in each slice. The CT imaging technique was 120 kV and 250 mA tube current. After the CT simulation, digital imaging and communications in medicine CT images were transferred to the TPS for contouring and planning preparation. The anatomy structures, including PTV and OARs (brain and esophagus) were manually contoured as shown in [Figure 1]. The prescriptions and optimization objectives used for all treatment plans were based on the IROC phantom irradiation condition. The prescription dose was 66 Gy but to accommodate the range of dosimeter responses, a single fraction of 6.6 Gy was delivered to 90% of the region-of-interest mean dose to the PTV for all plans. This dose level was chosen to be consistent with the Radiation Therapy Oncology Group (RTOG) recommendations for this clinical radiotherapy. A primary goal of treatment planning was to ensure that PTV coverage was 90% of the prescription dose for each technique. A linear accelerator (Clinac 21iX, Varian Medical Systems, Palo Alto, CA, USA) was used for dose delivery. Six MV photon beams were used for all cases, and the adaptive convolve algorithm was used for the plan optimizations and dose calculations. Each plan used a maximum dose rate of 600 MU/min and was optimized with the direct machine parameter optimization algorithm for both IMRT and VMAT. To make fair comparisons, no modification was done throughout the optimization to the dose-volume constraints and weighting for IMRT and VMAT. The mean and maximum doses and volumes receiving >20 and 38 Gy of OARs were calculated and compared among each technique. The lifetime probabilities of increasing fatal secondary malignancies were calculated using per Sievert (Sv) absorbed in OARs (brain and esophagus) using the NCRP Report 116. Mean doses were used for calculating fatal secondary risk in OARs due to the fact that they would be responsible for secondary malignancies according to a parallel study by Rehman et al. RTOG conformal index (CI) is defined as the volume of the PTV receiving the prescription dose divided by total volume of the PTV and its optimal value is 1 as shown in equation (1). Homogeneity index (HI) is defined as the dose received by 5% of the PTV divided by the dose received by 95% of the PTV. Its optimal value is equal to 1 as shown in Equation (2). Dose-volume histograms (DVHs) were used to provide quantitative comparisons among the different spine radiotherapy techniques (3DCRT, IMRT, and VMAT). Therefore to ensure an unbiased comparison for successive computation of various indices, all mean DVH data for the studied H and N techniques were gathered from Pinnacle  with a bin size of 0.05 Gy. PTV and OAR DVHs for different H and N radiotherapy techniques were calculated. The brain and esophagus NTCP were calculated using the Lyman-Kutcher-Burman algorithm  using the following equations. In Eq. (5), vi and Di were volume and dose with the number of voxel equal to i in the differential DVH. The values of n for the brain and esophagus are equal to 0.25 and 0.06 according to the Lyman-Kutcher-Burman algorithm. In this study, all 3DCRT, IMRT, and VMAT plans satisfied a minimum of 90% prescribed PTV coverage and a goal of achieving the minimum dose to the OARs using the IROC H and N phantom. Dosimetric comparisons of treatment plans for all techniques are shown in [Figure 2]. It is seen from the isodose lines that the VMAT plan delivered lower doses to the OARs, namely, brain and esophagus than the 3DCRT and IMRT plans. The DVH for the PTV is shown in [Figure 3]a while the DVHs for the OARs such as the brain, and esophagus are shown in [Figure 3]b and [Figure 3]c. It can be seen that VMAT delivered lower doses than the other two techniques. 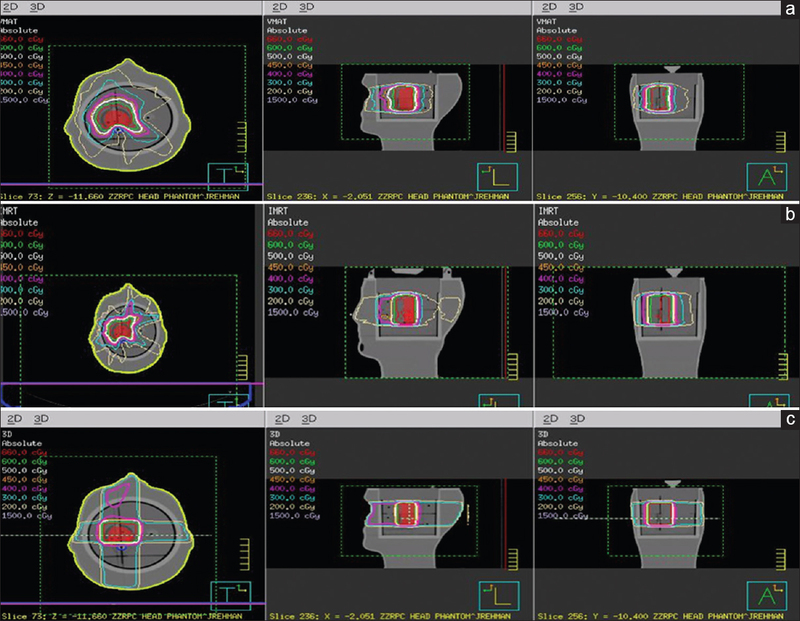 CI was calculated for 3DCRT, IMRT, and VMAT plans and their values were 0.90, 0.91, and 0.95. Results of HI were 1.08, 1.16, and 1.06 for 3DCRT, IMRT, and VMAT plans, respectively. [Table 1] compares the mean and maximum doses to the OARs for estimating the risk of stochastic and deterministic effects using 3DCRT, IMRT, and VMAT techniques for HN radiotherapy. Mean and maximum doses in OARs were lower for VMAT as compared to other techniques. The maximum doses to the brain and esophagus were greater in 3DCRT than IMRT, and significantly smaller when using VMAT. For comparison with representative patient treatments, [Table 1] reports the doses to OARs that would be received for a prescription dose of 66 Gy. To estimate the secondary cancer risk, [Table 2] evaluates the analogous volumes of OARs receiving >20 Gy and 38 Gy from the different H and N radiotherapy techniques. The volumes of esophagus and brain organs are shown in [Table 2] and lifetime secondary cancer risk for such organ are shown in [Table 3]. The probability of lifetime secondary cancer risk per Sv was taken from the NCRP Report No. 116. Mean doses to OAR were used for the calculation of secondary cancer risk. The NTCP and EUD for the brain and esophagus were calculated and shown in [Table 4]. [Figure 3]a shows the DVHs for the PTV for three delivery techniques. The dose range in [Figure 3]a started from 37 Gy rather than 0 Gy to focus on the drop-off region of the DVH curve. PTV coverage was found to be same 90% for each technique, i.e., 3DCRT, IMRT, and VMAT by using normalization method for fair comparison. DVHs for the OARs including brain and esophagus showed that doses delivered by VMAT were lower than those by IMRT and 3DCRT as shown in [Figure 3]b and [Figure 3]c.
Lee et al. have developed and compared a smart-arc based technique with conventional radiotherapy for spine craniospinal irradiation using 23.4 Gy per 13 fractions. They reported a median CI of 1.22 (1.09–1.45) and 1.04 (1.03–1.07) and suggested a noteworthy reduction of mean and maximum doses to the heart, thyroid, esophagus, optic nerves, and eyes when compared to conventional plans. In our study, CI for VMAT plan was 0.95 and was closest to unity, which showed that VMAT plan was more conformal than other plans. The mean and maximum doses were also lower in most OARs. HI for VMAT plan was found to be 1.06 and was the lowest than other plans that indicated VMAT was more homogeneous than other techniques. In general, extremely conformal and homogeneous dose distributions were attainable with VMAT due to its high angular sampling rate of radiation beams. The variation of parameters depends on different weightings and priorities used during planning. One goal of this study was to generate highly conformal plans, with an acceptable small compromise of dose homogeneity. The mean dose to esophagus was higher for both 3DCRT and IMRT than VMAT. Lower mean doses were seen for both OARs for VMAT than other techniques. 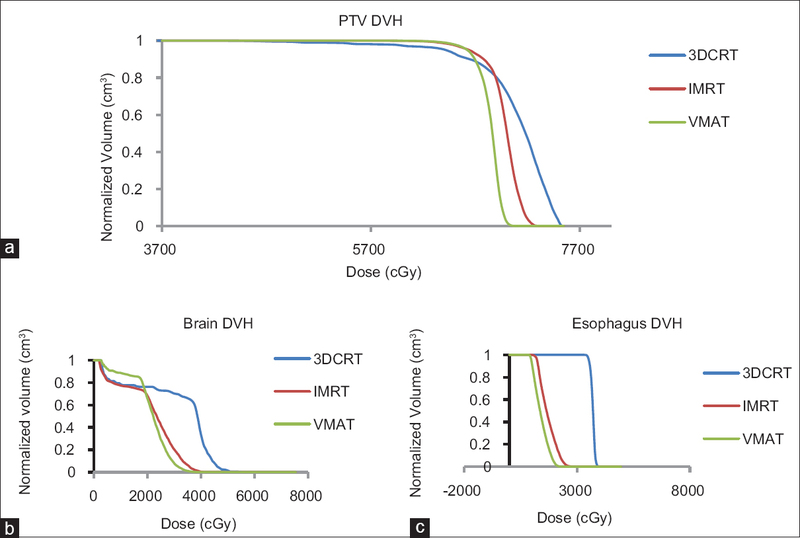 The 3DCRT yielded largest maximum doses in the esophagus (40 Gy), and brain (56 Gy) as compared to IMRT and VMAT techniques. It is also revealed that VMAT delivered the lowest maximum doses to the esophagus (23 Gy), and brain (40 Gy) as shown in [Table 1]. Hall and Wuu highlighted that the risk increased with a linear proportionality to dose between low doses and moderate doses (from 0.1 to 3 Gy)., Little differentiated between A-bomb survivors and patients treated by radiotherapy to the role of cell killing at doses higher than 2 Gy, but the investigation of Rubino et al. did not offer verification for a role of cell killing. Some other studies advised a threshold of about 0.6 Gy in adults after fractionated radiotherapy and after acute irradiation in children at 0.1 Gy. We consequently choose volumes receiving >20 and 38 Gy for comparison in our analysis to find the best technique for reducing secondary cancer risk among 3DCRT, IMRT, and VMAT for OARs because from 1 to 19 Gy, all techniques remained almost the same. For VMAT, it can be seen in [Table 2] that only 3.6% of the volume of esophagus received dose > 20 Gy. This is smaller than IMRT and 3DCRT having 23.6% and 100% of the volumes of esophagus receiving doses > 20 Gy, respectively. There were only very small volumes of esophagus receiving higher doses > 38 Gy from VMAT (0.1%) and IMRT (1.7%) as shown in [Table 2]. In [Table 4], it can be seen that the NTCP of the esophagus and brain are ranged from 0.4% to 4.2% for the 3DCRT, IMRT, and VMAT technique. These small NTCP values of OARs showed that the critical organ sparing in these three radiation dose delivery techniques are better. However, the NTCP of the esophagus and brain for the IMRT and VMAT are about 3–10 times smaller than those for the 3DCRT, revealing that the intensity modulated techniques can provide better critical organ sparing than the traditional conformal method. Comparing the IMRT and VMAT plans, it is seen that the NTCP for the esophagus and brain in the VMAT plans (0.4% and 0.8%) are slightly smaller than the IMRT (0.7% and 0.9%). This shows that the VMAT technique is slightly better than IMRT in the critical organ sparing for the H and N plans. In addition, the NTCP results were agreed well with the EUD, in which the EUD of the OARs for the 3DCRT are higher than those of the IMRT and VMAT, and the EUD of the esophagus and brain are found smallest (1.8 and 2.3 Gy) when using the VMAT technique. The majority of dosimetry studies have previously focused on dose in regions far away from the target volume because the dose close to the target appears to be essential when treating primary cancer. On the other hand, most cancer incidence data are based on second cancers found close to the target volume due to the obvious reason that there is a greater chance for a second cancer to occur in these regions that receive relatively higher dose levels. Hall showed that the risk of cancer increases with a linear proportionality to dose between low doses and moderate doses (from 0.1 to 3 Gy). The maximum doses to OARs in this study were lower after VMAT than 3DCRT. The additional uncertainty of the risk estimation was based on the different dose rate and time schedule, which is fractionated application over 6 weeks versus single dose. However, in this study, the estimated risk for secondary cancer in the respective OARs was considerably lower after VMAT and IMRT as compared to 3DCRT as shown in [Table 3]. The probability per Sv was taken from the NCRP Report #116. We have calculated the secondary risk cancer from mean doses of OARs in all techniques. The calculated doses to the OARs in this study were considerably lower with VMAT than with 3DCRT and IMRT. Therefore, the estimated risk for secondary cancer should be considerably lower with VMAT for H and N radiotherapy. This is to the best of our knowledge the first report about the estimation of H and N second cancer risk using VMAT. In comparison with IMRT and 3DCRT, the calculated mean and maximum doses for OARs were lower for VMAT, as were the volume of OARs treated at high doses (>20 Gy). These doses to OARs were verified using film and TLD dosimetric systems. NTCP and EUD values of the OARs were found the smallest in VMAT, although both VMAT and IMRT technique have higher critical organ sparing than the 3DCRT. This would suggest that the risk of secondary cancer induction after VMAT is lower than after IMRT or 3DCRT in H and N cancer. The authors would like to thank Pei-Fong Wong, MS for his assistance and guidance in preparing the treatment plans; Nadia Hernandez, MS and Andrea Molineu, MS for assistance with preparing and irradiating the Radiological Physics Center H and N phantom, and with analyzing the results; and Ryan Grant Lafratta, MS for assistance in preparing the gamma index calculations. Higher Education commission (HEC), Pakistan. Movsas B, Hanlon AL, Pinover W, Hanks GE. Is there an increased risk of second primaries following prostate irradiation? Int J Radiat Oncol Biol Phys 1998;41:251-5. Land CE, Tokunaga M, Koyama K, Soda M, Preston DL, Nishimori I, et al. Incidence of female breast cancer among atomic bomb survivors, Hiroshima and Nagasaki, 1950-1990. Radiat Res 2003;160:707-17. Preston DL, Shimizu Y, Pierce DA, Suyama A, Mabuchi K. Studies of mortality of atomic bomb survivors. Report 13: Solid cancer and noncancer disease mortality: 1950-1997. Radiat Res 2003;160:381-407.
International Commission on Radiological Protection. Low-dose extrapolation of radiation-related cancer risk. ICRP Publication 99. Ann ICRP 2005;35. National Research Council. Health Risks from Low Levels of Ionizing Radiation: BEIR VII, Phase 2. Washington, DC: The National Academies Press; 2006. National Council on Radiation Protection and Measurements. National Council on Radiation Protection and Measurements Report No. 116 – Limitation of Exposure to Ionizing Radiation; National Council on Radiation Protection and Measurements; 1993. Park CC, Henshall-Powell RL, Erickson AC, Talhouk R, Parvin B, Bissell MJ, et al. Ionizing radiation induces heritable disruption of epithelial cell interactions. Proc Natl Acad Sci U S A 2003;100:10728-33. Tubiana M. Dose-effect relationship and estimation of the carcinogenic effects of low doses of ionizing radiation: The joint report of the Académie des sciences (Paris) and of the Académie Nationale de Médecine. Int J Radiat Oncol Biol Phys 2005;63:317-9. Little MP, Muirhead CR. Evidence for curvilinearity in the cancer incidence dose-response in the Japanese atomic bomb survivors. Int J Radiat Biol 1996;70:83-94. De Vathaire F. Epidemiologic data on the carcinogenic effects of low doses of ionizing radiation. Environ Risques Santé 2005;4:283-93. Schneider U. Mechanistic model of radiation-induced cancer after fractionated radiotherapy using the linear-quadratic formula. Med Phys 2009;36:1138-43. Tsien C, Eisbruch A, McShan D, Kessler M, Marsh R, Fraass B, et al. Intensity-modulated radiation therapy (IMRT) for locally advanced paranasal sinus tumors: Incorporating clinical decisions in the optimization process. Int J Radiat Oncol Biol Phys 2003;55:776-84. Chao KS, Majhail N, Huang CJ, Simpson JR, Perez CA, Haughey B, et al. Intensity-modulated radiation therapy reduces late salivary toxicity without compromising tumor control in patients with oropharyngeal carcinoma: A comparison with conventional techniques. Radiother Oncol 2001;61:275-80. Rehman Ju, Tailor RC, Isa M, Afzal M, Chow J, Ibbott GS, et al. Evaluations of secondary cancer risk in spine radiotherapy using 3DCRT, IMRT, and VMAT: A phantom study. Med Dosim 2015;40:70-5. Rehman J, Iqbal T, Tailor R, Majid A, Ashraf J, Khan I, et al. Dosimetric comparison among different head and neck radiotherapy techniques using PRESAGE® dosimeter. Int J Cancer Ther Oncol 2015;3:349. Lee YK, Brooks CJ, Bedford JL, Warrington AP, Saran FH. Development and evaluation of multiple isocentric volumetric modulated arc therapy technique for craniospinal axis radiotherapy planning. Int J Radiat Oncol Biol Phys 2012;82:1006-12. Chow JCL, Jiang R. Dose-volume and radiobiological dependence on the calculation grid size in prostate VMAT planning. Med Dosim 2018. pii: S0958-3947(17)30137-1. Li R, Xing L. Bridging the gap between IMRT and VMAT: Dense angularly sampled and sparse intensity modulated radiation therapy. Med Phys 2011;38:4912-9. Rubino C, de Vathaire F, Diallo I, Shamsaldin A, Grimaud E, Labbe M, et al. Radiation dose, chemotherapy and risk of lung cancer after breast cancer treatment. Breast Cancer Res Treat 2002;75:15-24.